2. On the stove, heat a sauté pan. Spray the pan with oil, and sauté peppers, onions and garlic until tender. 3. Crumble the Beyond Burger. 4. In a bowl toss the crumbled Beyond Burger and the tofu with marinara sauce. 5. Once steps 1 through 3 are complete it is time to assemble the lasagna. 6. 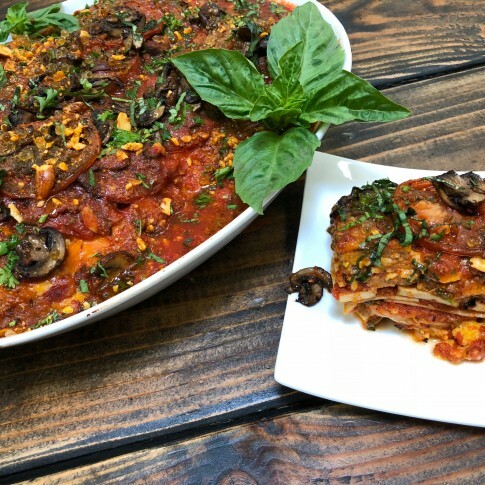 In a baking pan, assemble the lasagna alternate layers of noodles, thinly sliced sausage, tofu and mushrooms. Repeat the layers and end with a layer of noodles on top. 7. Finish the top off with diced tomatoes, fresh basil and parsley. 8. Cover the baking pan with foil and bake at 375-degrees F for 45 – 60 minutes or until heated throughout.